Wheeltek Nationwide employee, Arlyn, took again to Facebook another inspiring story that has caught the hearts of netizens. 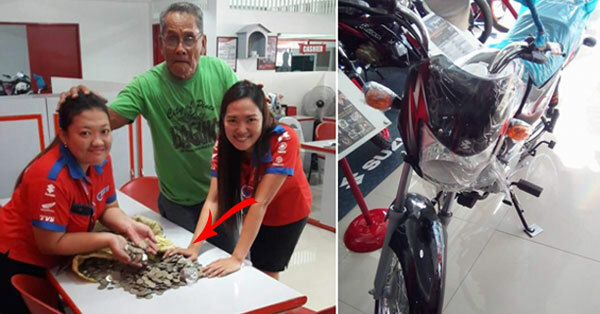 Tatay Lando, as he is now fondly called by netizens, saved ten-peso coins for two years and went to buy a motorcycle from Wheeltek. It was also mentioned in one of the comments that Tatay Lando has kids working abroad. He also has a kid who is a policeman. But he opted to save on his own to buy the Motorbike for himself. It’s really hard to save. Not everyone can do it. Take for example a certain commenter named Boyet, who shared Arlyn’s post. He said, “(I saved, yet not even a month passed and my piggy bank got beheaded. (Nag-ipon ako kaso di umabot ng buwan napugutan ng ulo yung alikansya)”. Maybe he meant it as a joke but it’s a reality. Saving is hard. And not really a laughing matter. We may joke about it, but Tatay Lando took it seriously. Kids these days, and adults even, should take note of Tatay Lando’s story. It showed that with perseverance, dedication and inspiration, we can achieve whatever it is we put our mind into. This doesn’t apply to Tatay Lando alone. What dedication, perseverance and patience must these two ladies have to count all the coins! Kudos!